Dimensions 17.32" x 5.51" x 1.61"
I've had this beauty for over a year now and I'm forever loyal to Ducky as a result. This keyboard is perfect in every way. The instructions are clear and easy to follow for customizing things. The settings are always a few buttons away, super easy to access. 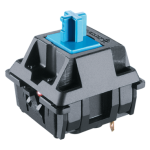 Blue switches are great, response is flawless, and the best thing, no software is needed. Per key lighting works wonderfully with customizable brightness for each key, and there are two different profiles that can be saved. Macro keys are the most useful feature, and six different profiles allow different macro settings to be used swiftly and easily. The per-key lighting settings apply to whichever macro key profile is active. There are a variety of brightness settings. The detachable cord is super convenient for transport, and the keyboard comes with a plastic cover that helps a lot with keeping dust off the keyboard when it's not being used. The lights come in various brightnesses, and the lighting is amazing. An RGB is definitely in my future. There's not a single bad thing about this keyboard! 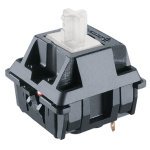 The activation point on the silver cherry mx switches are very fast. It only takes a ~1.2mm tap to get your keystroke through. As for Ducky's software, you can create a sea of macro keys, decide per-key multilevel lighting in two zones, and more. As a Dota player who uses alt keys and control keys all the time: With DIPs set to 1010 (which replaces left windows key with FN key), I'll be using fn keys (macro) to map my duties even closer and more comfortably together. As for the manufacturing, it's very sturdy. There are a few minor problems: the taller feet need to be pulled very hard initially, shaving off some plastic, and then it works fine. They don't include an extra context keycap for those who utilize the DIPs to move FN to the left. The "Cal" button is pretty pointless. There's no speed boost button for the mouse feature, which makes mouse mode a failed feature overall. Overall great keyboard. If you wanted these features in another manufacturer, you'd pay at least twice the price, and have to deal with a bad, overcomplicated design. Very good materials and general build quality. PBT keycaps are pleasent to touch. I like it much more than ABS.Excellent typing experience. Better than I've had with cherry mx blue on my other board. Very satisfied with this keyboard.